(W) Matt Kindt (A/CA) Clayton Crain. The most ambitious comics event of 2016 brings war to the 41st century - with Rai leading the charge! One hundred years from today, Father - the benevolent artificial intelligence that governs the island nation of Japan - will gain sentience. To defend its borders, Father will take drastic action by launching Japan into space...where its people will thrive in isolation, away from the overpopulated and resource-deprived planet below. Over the centuries, as New Japan orbits our increasingly unstable world, it will become a model society - one built on peace, prosperity... and Father's control. A thousand years from today, Father will create the first Rai, founding a lineage of technologically enhanced heroes engineered to defend New Japan and sworn to protect it from all enemies. For hundreds of years into the future, the Rai will single-handedly enforce New Japan's justice well...and serve Father without question. Now, at the dawn of 4001 A.D., the latest Rai is about to inherit the dark truth behind the origin of his kind...and discover the sinister secret at the heart of Father's existence. For New Japan to live, Earth must die...and as Rai challenges his former master for the first time in more than a millennium, the lone guardian of New Japan will be cast out of his own Father's kingdom... Exiled from the only realm he's ever known, Rai now walks the ravaged world of 4001 A.D. in search of forgotten heroes like himself... on a mission to collect the last surviving legends of a broken planet...and to forge a rebellion with the power to bring the most advanced civilization in history crashing back down to Earth. 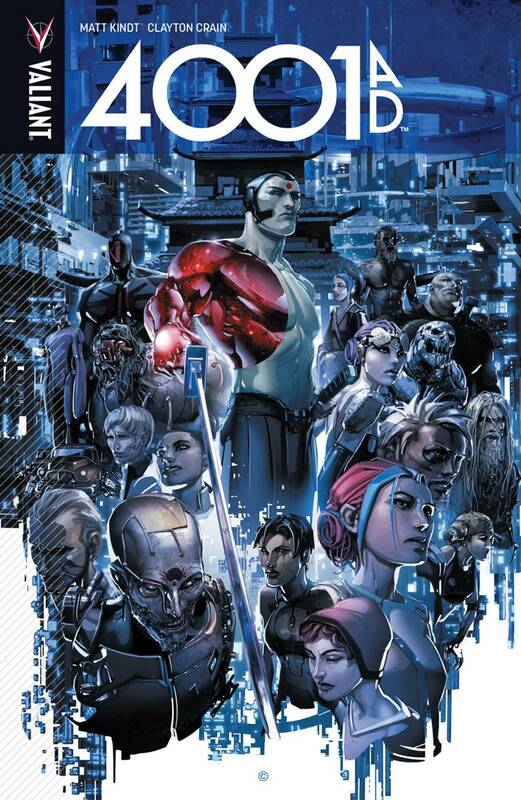 New York Times best-selling writer Matt Kindt (DIVINITY II) and superstar artist Clayton Crain (X-Force) bring their startling vision of the year 4001 A.D. to new heights...with the fate of New Japan floating in the balance! Collecting 4001 A.D. #1-4 .